This video was released to promote the party’s 2011 election plank: Close Ontario’s Race-based Public Schools. 2. Toronto’s Africentric School. Transcript: [CTV]: “Late last night, the Toronto District School Board approved a controversial proposal to create the city’s first black-focus public school”. [Paul McKeever]: “In 2008, the Toronto school board decided to establish a black-focused public school. Liberal Premier Dalton McGuinty refused to stop it.” [CTV]: “…but he is not taking any action to stop the board from establishing the school”. [Paul McKeever]: “Tim Hudak’s Progressive Conservatives did not object to it. The school now teaches little children that their potential, and their values, are determined by the colour of their skin. A Freedom government will eliminate race-based public schools.” [Jordan Manners’ mother, Loreen Small]: “This black school thing: no, it ain’t right”. [Paul McKeever]: “One race, the human race. Freedom Party”. January 25, 2011 – Freedom Party leader Paul McKeever was interviewed today on the the popular radio program Friendly Fire with Ryan Doyle and Tarek Fatah, (CFRB 1010 AM, Toronto). 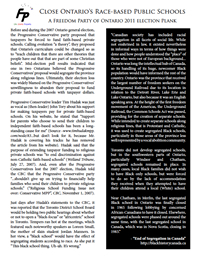 The topic: Freedom Party’s 2011 election plank on Closing Ontario’s Race-based Schools. On Friendly Fire (NewsTalk 1010AM CFRB, Toronto, Ontario, with hosts Ryan Doyle and Tarek Fatah) Paul McKeever, leader, Freedom Party of Ontario discusses Freedom Party’s proposal to close Ontario’s race-based public schools. 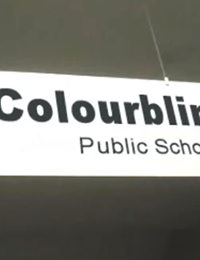 “In September of 2009, a taxpayer-funded “Africentric” public school was opened in Toronto. 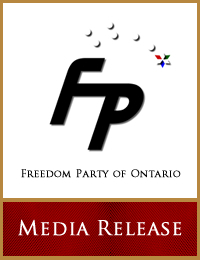 A 2011 election plank issued today by Freedom Party of Ontario proposes that the school be closed, and that the law be changed to prevent Ontario school boards from opening such schools ever again…” Click here to read the full media release. 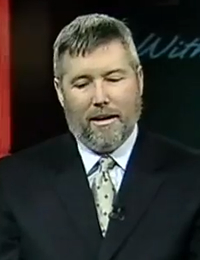 January 22, 2011 – Paul McKeever was a panelist on today’s premier episode of the television program On the Front Line with host Christine Williams (CTS). The topic was free speech. You can watch the show online at: www.ontthefrontline.tv .